Inventory We are a resale marketplace, not a box office or venue. Ticket prices may exceed face value. This site is not owned by Greek Theater Berkeley . The William Randolph Hearst Greek Theatre was built in 1903 and is on the National Register of Historic Places. The Greek Theatre, as it is commonly called, has a seating capacity of 8,500 and is used primarily for concerts during the summer months. The venue is used annually for the UC Berkeley graduation ceremonies and also has many public addresses by influential speakers. 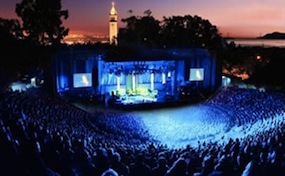 Greek Theatre Berkeley tickets have included shows like Wilco, Train, Bob Dylan, The Cure, Greeen Day, and many more. The Greek Theatre box office is located at 2001 Gayley Road in Berkeley, California. Greek.TheatreBerkeley.com is not currently affiliated with any primary box office, venue, or official website. We are a privately owned and operated company that concentrates solely in the online resale of secondary market inventory. Prices on our sites may be well above or below face value and have a tendency to change quickly with market conditions. To order all Greek Theatre Berkeley events simply call our specialists at anytime or follow the steps online through checkout.